Semi-skirted PCR plates are ideal for automated handling and other robotic procedures. Semi-skirted PCR plates can be easier to insert and extract than skirted plates. Our semi-skirted PCR plates are compatible with Bio-Rad’s T100™, C1000 Touch™, and S1000™ Thermal Cyclers and all CFX series real-time PCR systems. Use the PCR Plastics Consumables Selector Tool to determine individual plate compatibility with other instruments. 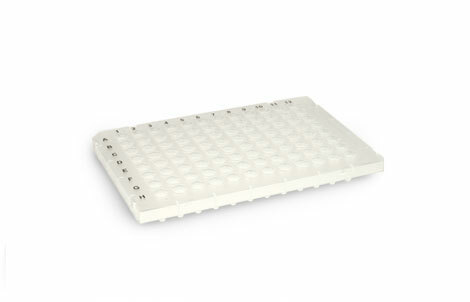 Several types of semi-skirted PCR plates are available to suit different needs. Hard-Shell® High-Profile and Low-Profile Semi-Skirted 96-Well PCR Plates feature a patented* two-component design engineered to remain warp-free, permitting precise positioning for automation, and have black lettering for easy identification. Hard-Shell plates are compatible with heat, pressure, and adhesive sealing. iQ™ High-Profile Semi-Skirted 96-Well PCR Plates are optimized for iCycler iQ®, iQ™5, MyiQ™, and MyiQ™2 Real-Time PCR Detection Systems. The semi-skirt adds stiffness and a labeling surface. The plates are perforated every three columns for easy setup of triplicate reactions. Microseal® High-Profile Semi-Skirted 96-Well PCR Plates have raised edges around the plate; a pressure pad (ADR-5001) is required when sealing these plates with film for use in any Bio-Rad thermal cycler.